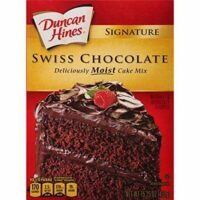 Kay’s Swiss Chocolate Cake is a feather-light Swiss chocolate cake (mix) iced with whipped cream. It is my sister’s most requested cake. This feather-light chocolate cake goes down way too easily. My Alabama sister takes it to church meetings, family gatherings, and anywhere else people congregate to accomplish big things or just want to visit for awhile. She claims it’s expected she will bring it and has become her most requested cake. Personally, I’m a pie or a tart person. But sometimes, cake travels better or is more celebration-appropriate. My oldest son’s recent birthday was the excuse I needed to bake this cake. It’s a four layer affair (2-layers split to make 4) made with a Swiss chocolate cake mix (she says it must be Swiss) and a sinful amount of sweetened whipped cream. How Can I Make This Cake Look Fancy Without Decorating Skills? But the whole recipe was evidently too simple, or maybe I felt guilty for using a cake mix. Whatever, I wanted to fancy it up a bit without much fuss. Inspiration struck me after I glanced at my dining room table scape seen below. When son #1 first saw my faux cake slice a couple years ago, he asked if it was our dessert. Of course, it was not. Remembering that conversation, it hit me. 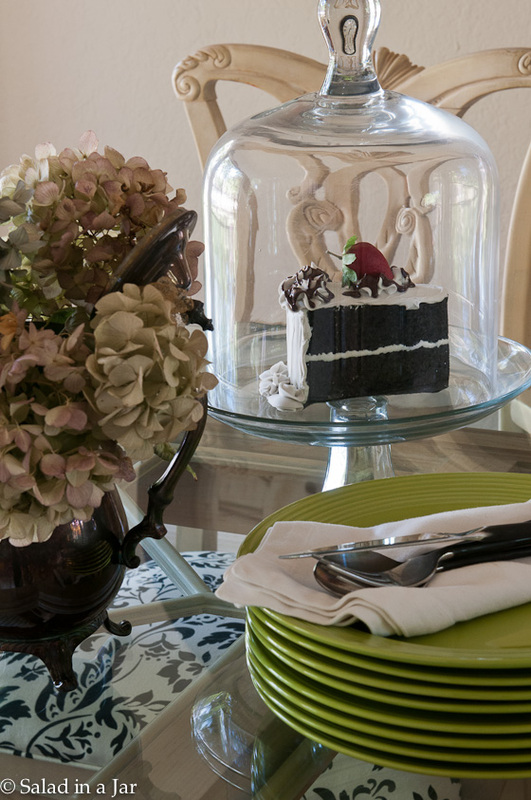 Kay’s chocolate cake could be the perfect starting point for replicating the painted styrofoam cake. Grab some canned whip cream like Redi-Whip (or use whipped cream inside a decorator bag) and run squiggles on the bottom where cake meets plate. Second, run squiggles of whipped cream around the top edge. Next, drizzle some chocolate fudge sauce over the edge as pictured. Finally, strategically place a fresh strawberry on top. Cover it with more squiggles of fudge sauce. What do you think? Compare the picture below (fake cake) to the picture above (real cake). Brings to mind that old saying about life imitating art. Follow the instructions on the box. Bake in two layers. I used 8-inch pans but 9-inch pans work better. When cool, split layers in half with a serrated knife. Whip cream. As it begins to stiffen, add sugar and vanilla. Continue whipping until you have soft but firm peaks. Be careful. If you whip too much, it will turn into butter. Spread whipped cream generously between each layer and then on top. I like to cover the sides but my sister does not. Store in refrigerator. Kay advises baking this cake in 9-inch round pans to avoid the "dome" effect.